The reconstruction of post-conflict societies requires the creation of national institutions responsible for justice, security, economic and social development. It is a complex task including different synergies among different sectors of society and the identification and introduction of innovative ways to improve the management of available resources (human, natural and financial). Areas characterised by weak government institutions and a lack of state sovereignty are potential sites for exploitation by criminal organizations and terrorist networks seeking staging areas to support international terrorist activities. Cooperation with international and regional entities is essential in order to facilitate the reconstruction and rehabilitation of national bodies in charge of security in post-conflict areas, particularly those affected by peacekeeping operations. Support of these entities is crucial, and can be given through applied research, technical assistance, and implementation of the UN’s strategic mission to build institutional capacity in post-conflict areas. It is vital that the international community assists states affected by conflicts, enhances inter-agency strategies for investigating and prosecuting war crimes, crimes against humanity and genocide: in order to make a direct contribution to restoring peace and security, as well as deterring future atrocities. In the post 9/11 world, the distinction between conflict and post-conflict societies has become increasingly imprecise, as interventions made with inadequate preparation can precipitate outcomes that were either anticipated and ignored or merely unanticipated, resulting in unintended consequences. The UN Security Governance Laboratory’s approach is intended to assist governments and international agencies to improve the planning of their security and counter-terrorism activities. This can and should also be applied in post-conflict realities where the urgency of multilateral action is crucial to gaining stability. A recent study1 of efforts at state building during peacekeeping operations in Haiti showed that the inability of the UN to achieve its goals was in part due to the fact that the UN took for granted that governance models developed in entirely different political and socio-economic environments could be transplanted effectively to Haiti. The article concluded that, while purporting to build an independent, democratic, and well-functioning state, the imported political models fostered disorder and dependence, whilst at the same time reinforcing instruments of control in the hands of international actors. While the United Nations imagined a state formally patterned along the lines of an idealized Western model of government, it ended up constructing institutions that were economically and politically deprived of the capacity to function as providers of political legitimacy and services to citizens. Economically and technically unsustainable, in need of continuous support from external actors, the subject of intense scrutiny by their own creators and funders, and the point of application of bilateral agendas through strict conditionality, ‘democratic institutions’ in Haiti produced the ironic effects of fostering state disintegration and internal disorder. Instead of ‘building the state’ and providing instruments of government in the hands of Haitians, the UN intervention ended up producing blurred spaces of governance, intensifying opportunities for international intervention, and reinforcing dependence. The application of the security governance model in Haiti with a focus on the common purposes at an early stage of the peace keeping operations could have enabled the UN to modify its plans together with the Haitian authorities and other actors to take account of the conditions prevailing in the country, thus substantially increasing the chances of a successful outcome. The current state of nation-building efforts in Afghanistan, with national and international actors struggling to establish and then work together on a common agenda, provides an excellent example of the potential role of the security governance model to deconstruct and analyse the security sector in a specific country context. the limited capacity of the Afghan government; and the unwillingness of donors to make long-term commitments of funds. 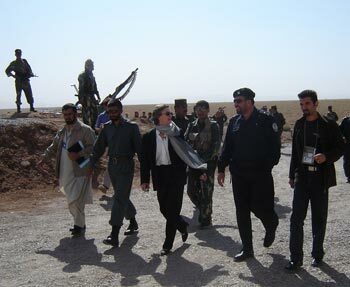 Furthermore, the 2004 study highlighted constraints and short-comings in several key issues crucial to effective security governance: local ownership and consensus; co-ordination; local capacity building; investment in traditional structures; donor funding; regional security; and international security support within Afghanistan. Defective co-ordination was apparent at each level in the development framework – lach of donor-donor, donor-government, intra-government and inter-agency coordination contributing to a lack of progress in all key sectors of the reconstruction agenda. According to the DCAF, after the virtual collapse of the state, local state building has seen ‛the current government… beset by problems of bureaucratic inefficiency, disorganisation and nepotism.’3 Although, it is well understood that ‘the ability to implement the principles of good governance in the security sector is reliant on the existence of well-functioning institutions and capable human resources’4 despite the fact that the necessary institutional reforms and the building of government capacity had not been implemented effectively. The international community had made insufficient effort to build on investment in traditional structures, especially those traditional structures that remained largely intact and could contribute to promoting security and stability in many areas of the country. Interference in the internal affairs of Afghanistan by regional and other states had long been part of the country’s history. Despite the signing of several declarations5, there was no evidence of reduced interference; rather the opposite was the case. International security support within Afghanistan has seen the expansion of responsibilities and coverage of the International Security Assistance Force (ISAF) whilst at the same time, bedevilled by a lack of commitment by member states. The stabilisation and reconstruction effort in Afghanistan has suffered from a series of problems, not the least of which has been the impact on Afghanistan of the deteriorating strategic situation in Iraq and the failure of Western actors involved in Afghanistan to see the growing interdependence of developments in these two theatres. From its outset, however, the reconstruction effort has suffered from a lack of capacity, which has in turn been worsened by shortcomings in the area of cooperation. NATO, the leading intergovernmental organisation on the stabilisation side, has not succeeded in acting as a platform for ensuring effective burden-sharing and cooperation among its members. But even if it had proved more effective in this regard, there would still have been limits on what it could do as an institution by and of its own efforts. NATO has no expertise in two areas that are critical for the stabilisation of Afghanistan: policing programmes, which aim to produce a sufficient number of well-trained and capable policing elements that can move into an area once the military have stabilised it, and reconstruction programmes, vitally necessary to accomplish a host of tasks related to domestic stability, such as repairing infrastructure, relaunching rural development and returning children to classrooms. It is only in 2007, more than five years into the campaign against the Taliban, that the EU, UN and NATO have started working together on police training programmes with the creation of an International Police Coordination Board Secretariat and a plan to standardise hitherto disparate approaches to police training. At the same time, NATO has not been involved in the leading multilateral reconstruction effort, namely, the Afghanistan Reconstruction Trust Fund administered by the World Bank, which has been in operation now since 2002. This is despite the fact that in the twenty-odd Provincial Reconstruction Teams operating in Afghanistan, NATO member states play a dominant role. Finally, this study, as many others before it, has also made clear that SSR cannot be successful unless intergovernmental organisations and their member states summon the necessary political will to ensure that a comprehensive and cooperative approach is taken to reform reconstruction efforts, which includes ensuring that the necessary resources are forthcoming to implement SSR in an effective and sustainable manner. The problems faced by the international efforts to reconstruct Afghanistan with insufficient resources, inadequate planning, and weak cooperation at all levels in the face of increasing insecurity, showcase perhaps the most complex national reconstruction effort ever attempted by the international community. There are evidently systemic weaknesses that have yet to be addressed effectively after more than five years of effort. The different (and changing) agendas of the various groups of actors, massive external interference, and inadequate practical long-term commitment from many of the players, further complicate the situation. The lack of a security governance framework, which could provide a comprehensive overview and hence facilitate an analysis of, and insights into, the key issues, is evident. The greater the complexity of a post-conflict situation, the greater the potential benefits could be for a security governance based approach. Doris Buddenberg is Senior Manager at the United Nations Office on Drugs and Crime (UNODC). She currently manages the United Nations Global Initiative to Fight Human Trafficking (UN.GIFT). (2) DCAF (2004): “Reform and Reconstruction of the Security Sector”; Editors: Alan Bryden, Heiner Hänggi. Geneva. (3) Sedra, M. (2004) “Consolidating an Elusive Peace: Security Sector Reform in Afghanistan”. In DCAF (2004) op. cit. (4) Ball N. (2002) “Democratic Governance in the Security Sector” In Sedra M. op. cit. (5) Starting with the Kabul Declaration on Good-neighbourly Relations in December 2002. (8) Law D.M. (2007): “Taking Stock, Moving Forward” in DCAF (2007) op. cit.